A customer's production of 'Stormy Sea'. Photo courtesy of Grosh Digital Backdrops. Technology continues its advances into all sectors of our lives, particularly in the performing arts’ sphere. The Grosh family business is not immune. Having opened its doors in 1932 with beautiful hand-painted backdrops for stage and screen, along with a custom department, the current proprietor and great-granddaughter, Amanda Uhlein, is excited about the possibilities of jumping into the future with digital backdrops. “Previously, the hand-painted backdrops were shipped wherever they were required to be used before being shipped back. Obviously, this takes time and would make it prohibitively expensive to do business with Australia, for example,” Uhlein explains. 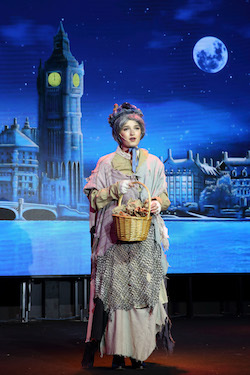 Maranatha Christian in ‘Mary Poppins’. Photo courtesy of Grosh Digital Backdrops. The advantages and benefits of using digital media are numerous. Firstly, the cost. They’re not expensive because the digital backdrops are all rented. You go online and check out the various backdrops available, including animated scenes such as night snow falling. And for a full week, you rent a still landscape for $95USD or animated for $145USD. Previously, it would have cost $450 to rent the hand-painted backdrop, not including shipping. 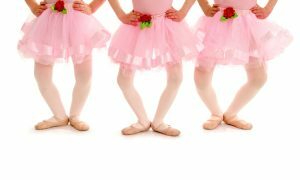 Customers can also upload their own content — for example, the logo of their dance school; they just need a jpeg image or MP4. 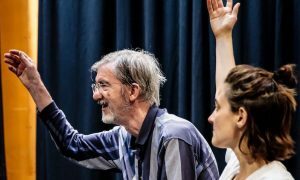 Initially, you use your chosen backdrop to rehearse with your performers, but there will be a Grosh watermark on it until such time as you “activate” the backdrop; then, the watermark disappears and your time starts counting down for the one-week rental. It all seems so easy! What specific technology or equipment is needed? 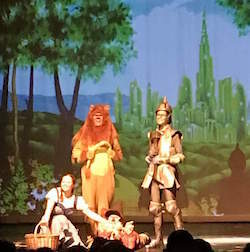 A customer’s production of ‘The Wizard of Oz’. Photo courtesy of Grosh Digital Backdrops. 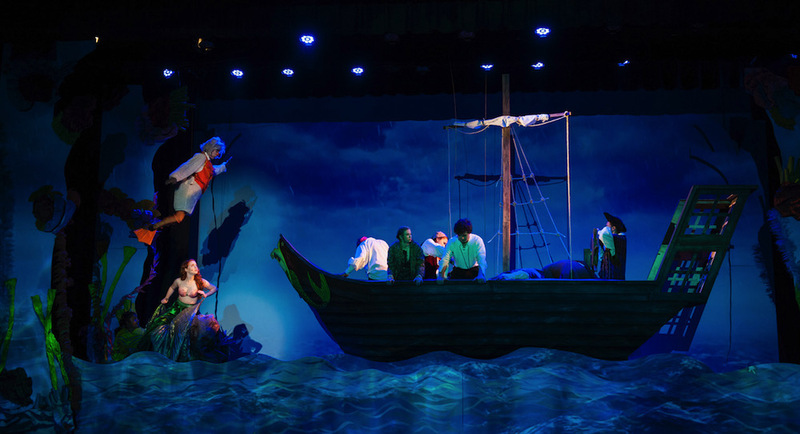 You’ll need a mounted projector and a screen or cyclorama for the best effect, but most theatres have mounted projectors and in-house tech support. Uhlein recommends a 5,000 or more lumen projector (to ensure the optimum intensity and brightness) and, of course, a screen or canvas behind the performers for the image to be projected onto. The minimum size stage to get the best effect would be between 20ft and 50ft wide, which includes most stages used by Grosh’s clients. As long as the overhead projector is sufficiently high and set up correctly, there should be no shadows. In terms of custom-made digital backdrops, Uhlein has been doing some trade shows and taking a lot of feedback from potential customers back to her production department. Taken on a case-by-case basis, the main criteria for a custom rental design will be whether or not the final product would be of interest to other customers. The same rationale applies to requests to alter specific digital backdrops or add animation. They can be, but it depends on whether they would be used by other clients. There are already some advanced digital backdrops which use animation, 3D and moving images such as flying over the rooftops à la Mary Poppins and the tornado in The Wizard of Oz. Grosh’s main clients include a variety of high schools for their performances, as well as dance companies. And the the most challenging request for a digital backdrop? A growing Christmas tree for The Nutcracker. “That presents quite a challenge, because the animation, as with all our animated scenes is on a loop, so someone needs to remember to transition the image before the tree starts growing again,” Uhlein points out. Finally, for those who are concerned about requiring technical support, Grosh is looking at opening up different time zones globally if assistance is required. But Uhlein re-affirms that this is a very user-friendly product and was designed for basic users. 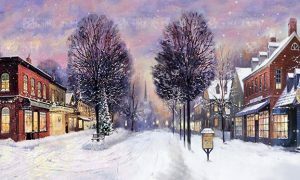 Now it’s easier than ever to have the perfect snowy landscape in your Nutcracker or a complete set of professional scenery for this year’s big performance! For more information on Grosh Digital Backdrops, visit www.groshdigital.com. Check out some how-to videos on Grosh Digital Backdrops here.